We offer a specialized service in Medication management. We help patients monitor their personal medications in relation to their prescribed medication regimen. Our clinicians also ensure that our patients safely avoid potentially dangerous drug interactions and other complications. We have found this most helpful with those taking large numbers of medications. 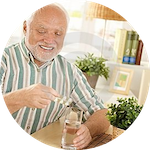 Taking multiple medications is known as polypharmacy, and it is particularly common among older adults, as they are more likely to need medications to manage an array of chronic conditions. At Personal Health Care Services LLC, we assess your medication use, including the use of high-alert medications. We look forward to serving you or your loved ones to ensure a safe, comfortable life style! “There are a number of aspects to medication management, all of which are focused on making sure that medications are used appropriately. Keeping track of all of the medications currently in use by a patient is an important part. This can include creating printed lists describing medications, their dosages, and how they are being used. These lists can be kept in patient charts and provided to patients to help them track the drugs they use and understand why various medications are being prescribed. Monitoring medication administration is also key. Medications usually need to be taken in specific doses at set intervals. Missing doses or timing doses incorrectly can cause complications. To manage this, everything from devices that issue reminders to patients to take their medications to filling pill cases for patients and marking the lid of each compartment to indicate when the contents need to be taken may be used. Another part of medication management involves checking for harmful drug interactions and confirming that patients follow directions for taking drugs. This includes ensuring that patients on medications with known harmful interactions are not provided with conflicting prescriptions. It also includes reminding patients about whether or not drugs need to be taken with food, and warning them about potential side effects such as fatigue, hunger, or altered level of consciousness that might disrupt their activities.